Remember those photos of the 2009 Mercedes Benz SLK we showed you yesterday? They're real. Seriously. Touch them. We don't mind. And now we've got more of them. The European version is going to get a refined version of the supercharged four with a boost to 184 hp as well as a worked over V6 good for an additional 33 hp, boosting the 3.5-liter to 305 hp at 6,500 rpm. The SLK 55 AMG is relatively unchanged, sporting the same 5.5-liter V8 mill, but getting the revised aesthetics. Press release and high resolution photos are below. 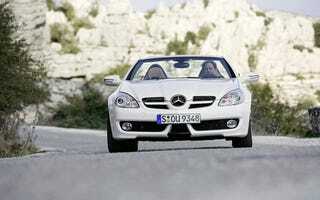 Stuttgart - The Mercedes-Benz SLK-Class Roadsters have long captured the hearts of sports car enthusiasts. Incorporating around 650 newly developed parts, the SLK models of 2008 are even more dynamic and now offer an even more emotionally charged driving experience. Key visual enhancements include new-look front and rear sections as well as a meticulously modified interior with a new instrument cluster and three-spoke sports steering wheel. A fast-running V6 sports engine developing 224 kW/305 hp and an optionally available direct-steer system truly bring the bold, dynamic character of the two-seater SLK 350 to the fore. Furthermore, all of the engines in the line-up are now far more economical on fuel and, therefore, emit even less CO2, despite a substantial increase in output in many cases. The new-generation SLK models will be available from April 2008, pricing will be announced early in 2008. The designers have given the already dynamic-looking two-seater cult model an even sportier appearance. Eye-catching features include the new-look front bumper with a modified air-dam arrangement and a more pronounced arrow shape. Plus the area around the Mercedes star has been restyled to render it even more succinct. In addition, the designers have modified the rear end by introducing a diffuser-style lower section that makes the Roadster appear more powerful when viewed from behind - an effect that is enhanced considerably by the trapezoidal exhaust tailpipes and the AMG-inspired darkened tail lights. The now larger exterior mirrors feature LED indicators with a pronounced arrow shape, while the range of light-alloy wheels is also almost entirely new. Passengers can enjoy a unique listening experience, regardless of whether the vario-roof is open or closed, thanks to the optionally available harman kardon® Logic7® sound system. Rich and voluminous surround sound makes for crystal-clear listening pleasure, the like of which has never before been associated with a roadster. The Mercedes-Benz engineers paid special attention to the fast-running V6 sports engine that makes its debut in the new-generation SLK, totally altering the six-cylinder unit's character by making sweeping changes to the mechanical setup. Although the displacement remains the same at 3498 cc, the engine now develops 224 kW/305 hp at 6500 rpm - some 24 kW (33 hp) more than its predecessor. The peak torque has also been boosted, by 10 Nm, and now stands at 360 Nm when the engine is running at 4900 rpm. This result was achieved by raising the engine speed limit to 6800 rpm; it can even be increased to 7200 rpm for a brief period - oil temperature and other engine parameters permitting. Other changes introduced include a higher compression ratio, a new intake manifold and an extensively modified valve train. Further aspects which add to the emotionally charged appeal of the new engine include deliberately powerful sports-engine acoustics with a strikingly emotive sound design when decelerating. In combination with the 7G?TRONIC automatic transmission, the engine management system also blips the throttle automatically during downshifts. As well as producing an extremely sporty sound, this throttle-blipping function reduces load alteration effects. Despite the higher output and high-calibre performance, the SLK 350 consumes considerably less fuel. With the six-speed manual transmission on board, combined fuel consumption is just 29.7 mpg; if the 7G-TRONIC automatic transmission is fitted, the sports powerplant returns a combined fuel consumption of just 30.7 mpg. Lower fuel consumption means that CO2 emissions are also reduced - by 23 g/km to 219 g/km in the automatic version and by 28 g/km to 227 g/km in the manual version. * The output of the four-cylinder supercharged engine has been boosted by 15 kW/21 hp (to 135 kW/184 hp), while its torque has been increased from 240 to 250 Nm. Combined fuel consumption has been reduced to 36.7 mpg whilst CO2 emissions have been reduced by 27 g/km to 182 g/km. * The SLK 280 has also been further improved with respect to fuel economy and, therefore, CO2 emissions. Fuel consumption has been cut to 30.4 mpg (if an automatic transmission is fitted, the figure is 31.0 mpg), while CO2 emissions have been reduced by 11 g to 220 g/km (if an automatic transmission is fitted, the figure is 6 g lower at 216 g/km). * The SLK 55 AMG is still equipped with the familiar 5.5-litre V8 powerplant developing 265 kW/360 hp and a peak torque of 510 Nm. On a technical level, the SLK 55 AMG remains almost unchanged. The only differences are a few visual enhancements. The front end of the AMG model now features a new apron with a black-painted cross strut and side air outlets as well as darkened headlamps. As trendsetters and technology leaders, the SLK-Class Roadsters have long enjoyed the image of a modern cult car. Even after the extensive modifications, the familiar outstanding qualities remain, for example, the vario-roof that transforms the roadster into a coupé in 22 seconds, not to mention the extensive standard-equipment package, including head/thorax sidebags, adaptive front airbags and two-stage belt-force limiters. Plus the roadster also comes with the option of the unique AIRSCARF neck-level heating system, which allows open-top driving pleasure all year round, even in winter.